Five members of Viking Kayak Club successfully paddled their sea kayaks across the English Channel on Saturday in a bid to help raise money for charity as part of their Big 5 Kayak Challenge. The conditions did not look good on the morning with force four north easterly winds and a forecast that it would get stronger, but the team had two support boats accompanying them and decided to go for it. The team, including Rob Bates, Richard Harpham, Dave McCarthy, Aisling Ni Chiunn and Geoff Tilford, left Dover harbour around 9.30am in the morning. As soon as they had left the harbour walls it was obvious that the sea was going to be very choppy, with irregular breaking waves called ‘white horses’ all the way. The Channel is highly controlled with marked out shipping lanes five miles wide for traffic going east and west and the team made good progress towards the first of the two main shipping lanes. They constantly had to use support strokes and had waves breaking on their decks but made to the half way point. Aisling Ni Chuinn joint team leader commented “Crossing the busy shipping lane was something we were nervous about despite the support boats, it was like a giant version of the computer game Frogger”. At this time they had to try to ‘raft up’ by putting their kayaks together which in these seas is not easy and can be dangerous, but without it there was no way they could get to their food supplies safely. After a quickly eaten banana or peanut butter sandwich they moved on again. The team on the support boat was having an even worse time as the boats, which are legal requirements of crossing the busy shipping lanes, tossed around in the choppy seas and all the passengers were sick and couldn’t take the video footage they planned. Lance Oram, the support boat skipper confirmed that the conditions were “A little bit cheeky “. They cleared the westbound shipping lane and the wind strengthened again as they approached France. 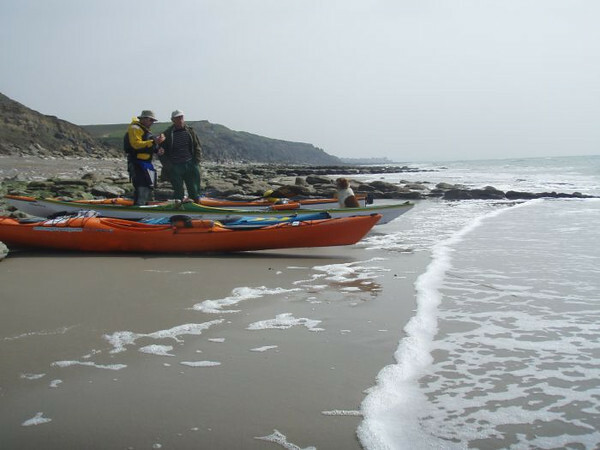 After 5 hours and 11 minutes the team finally made in to the beach at Cap Gris Nez, the shortest crossing point and a distance of just over twenty miles, to be met a chatty Frenchmen and his dog Raul who didn’t seem to mind the little invasion force and said he’d like to offer the team a warm drink at his house up on the cliff top! oat for the return journey the winds had reached 25 miles per hour and the team faced rolling seas. But they made it back safely and celebrated with Fish and Chips in Dover. A number of the team followed the Channel Crossing by competing in the Bedford Canoe Marathon the next day with Aisling Ni Chuinn and Richard Harpham winning the Div 9 K2 event in their first race together and Geoff Tilford winning the Division 5 race by a good margin. This trip was the third of the Big 5 challenges and is raising money for the Muscular Help Foundation which helps children with Muscular Dystrophy. If anyone would like to support the team’s cause then please visit our just giving pages. Now the team are looking forward to their next challenge where they plan to paddle from Lands End to the Scilly Isles!